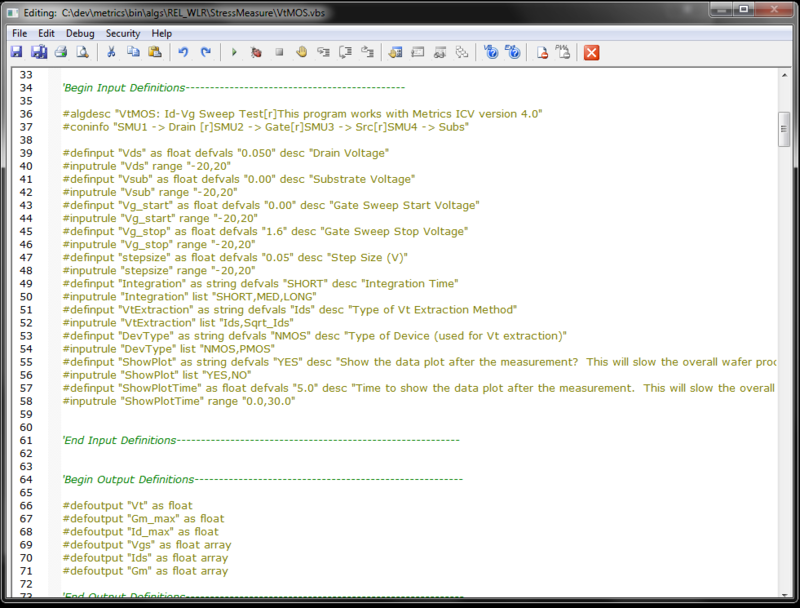 are also included for performing parameter extraction and decision branching. • Resized the wafer map display size in the “Wafer Map Editor” to support larger wafers with small die. • Updated Metrics IDE algorithm suites with new version 4.2 security and performed some code refactoring and optimization. • General clean-up of the IDE algorithms and refinement of plotting routines for these algorithms; HCI, NBTI, NBTI-OTF. General optimization and clean up of REL_WLR algorithm code. Optimized Charge Pumping algorithms and added correction for tunneling current to existing VBScript code. Updated NucleusVision.svbs driver to add additional error reporting and logging capability. Added ‘directio.ini’ file to ‘C:\Metrics\instintdrvs’ directory in installation. NOTE: Adding this file and directory to installer file required creating a Service Pack release. Appying this update will overwrite all existing installation files so a full backup of modified files in the \algs directory is recommended before applying this update. NVMRampPulse2Cap* Applies ramp pulses to two (2) NVM capacitors simultaneously. * See System Requirements for ICV software product. ICV is required to use the Integrated Developer Environment (IDE).